Hello. My name is Emma, and in today's lesson, we are going to talk about something many students have difficulty with. 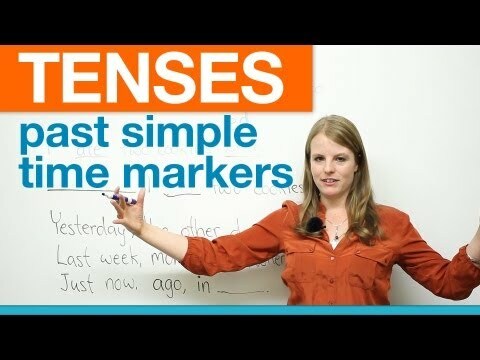 We are going to talk about the past simple -- or simple past -- tense and time markers, which can help students to figure out what tense to use. So I'll explain this in a second. First, my question: What is the past simple? What is the simple past? Well, "I ate two cookies." The present tense: "I eat two cookies. Every day, I eat two cookies." So in the past, we would say "ate". So usually, simple past are verbs, actions that end in "-ed". So we have "cleaned" -- "I cleaned the floor." "I cooked spaghetti." "I baked a cake." "I worked all night." These are all "-ed" -- past verbs. We also have some things called "irregular verbs", like "ate" -- "ate", "lay". What are some other irregular verbs? "I ran to school yesterday." "I run -- right now, I am running. Every day I run to school. Yesterday I ran to school." So these are irregular verbs. So if you look at my timeline, we have the future. What's the future? Everything after today. So this would be tomorrow. Maybe this would be a week from now. Maybe this would be 2020, and then 2050. So this is the future. This line right here represents now. Today it is the year 2013, okay? Maybe when you watch this, maybe it will be 2014, but right now, as I film, it is 2013. So that's the present; that's now. This is all the past, okay? This is all before. This is 1990, 1950, 2000. This is yesterday, so things that happened before. So when we talk about the past tense, we're talking about here. Okay. So now, let me tell you what "time markers" are. Many students, they hear the present -- present perfect: "I've never been to China." "I have eaten four cakes today." They hear this, and then they hear the simple past, "I ate four cakes." Which one do you use? Simple past? Present perfect? And teachers love to test on this. So how do you know? Well, one way is using things called "time markers". These are our time markers right here. So we have, "yesterday", "the other day", "last week", "last month", "last year", "when", "just now", "ago", and "in". So these are all words that we can use with the past simple or simple past. You do not use these words with the future. You do not use these words with any of the presents. You use them with the simple past or past simple. Okay. So let's do some examples. I could put "yesterday" here. "Yesterday, I ate two cookies." Okay? I could say, "Yesterday, I ate two cookies." "The other day, I ate two cookies." "Last week, I ate two cookies." "Last month, I ate two cookies." "Last year, I ate two cookies." Even if this isn't written, if it's a test: "I _________ two cookies." "I eat two cookies"? "I have eaten two cookies"? As soon as I see "yesterday", I know: "Yesterday -- ate." "The other day -- ate." "Last week -- ate." Okay? So these are your clues. So memorize them. Associate them with the simple past. Now, we have "when" here. What do I mean by "when"? "I ate two cookies when -- when I was eight years old." "I ate two cookies when I broke up with my boyfriend." Okay? So you can use -- when you see "when -- blah, blah, blah", "when I -- blah, blah, blah", this is a clue. This should be -- what should it be? Simple past or past simple; not present perfect. "Just now": "Just now, I ate two cookies." "Just now, I went shopping." "Just now, I made a video." Okay? So again, "just now" -- what is it? That's right. Past simple or simple past. "Ago": "ago"? This is when you're talking about a certain amount of time. "Two years ago, I went to Thailand." "Five years ago, I went to France." "Two days ago, I ate two cookies." Okay? So there's usually a number in either years, days, weeks -- "ago". As soon as you see "ago" -- past. Finally, the last one we will talk about today: "in". "In 1990 -- what happened in 1990? In 1990, I was a little kid." "In 2000, I finished grade 8." "In 2009, I think, I finished university." So if you see "in" with a year, what is it? It's simple past. Okay. Very good. And what do all of these things have in common? Again, they are talking about -- if we look at this -- a moment in time, okay? They're looking at a moment. They're not looking at this whole period of time. They are not looking at a long period of time. They're looking at a moment. All right, so let's do some questions to see how much you guys remember.